Disclosure: I received guest passes as compensation for this post. All opinions expressed are my own. When I’m traveling, there’s a few things on my list of “wants” for a hotel room. The first thing is a clean and comfortable environment where we can rest and relax. Next is access to wifi so I can check my emails, blog and social networking sites. The third “want” is free coffee that actually tastes good and doesn’t require me to leave my room half asleep in search of the nearest coffee shop. I’m not alone in my thinking. Carbonview Research, Inc. conducted a survey of 500 high-frequency travelers and asked them which amenities in a hotel room are the most important. WiFi was the first one, understandably, since we are a digitally connected society. However, coming in a second place was in-room coffee. Digging a little further, the survey also found that travelers prefer single serve coffee as their number one in-room coffee preference. I’d have to agree here. I only use my Keurig to make coffee at home and love the convenience and variety of flavours of the K-Cups. I recently learned about an exciting new partnership between Hilton Garden Inn and Green Mountain Coffee Roasters. 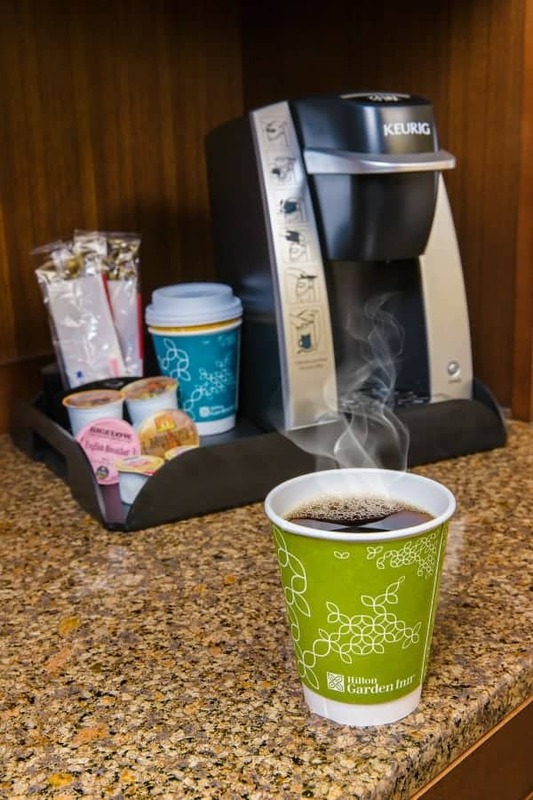 When you stay in one of Hilton Garden’s Inns 73,000 guest rooms throughout USA & Canada, you’ll be able brew your morning coffee in a Keurig® K130 single cup brewing system! You won’t have to run out bleary eyed with a bedhead to find coffee. Plus, Green Mountain Coffee Roasters makes amazing coffee so you’ll be able to sit and relax and enjoy your time away from home. Each Hilton Garden Inn will have four complimentary Keurig® K-Cup® packs along with the Keurig® K130 single cup brewing system. Your selection of K-Cups will vary depending on where you’re staying. If you’re like me and drink a lot of coffee or want access to other flavours, Hilton Garden Inn also makes that possible. You can purchase any of the eight Keurig Brewed® K-Cup® pack varieties, including Starbucks®, Green Mountain Coffee®, Bigelow® Black Tea and Café Escapes® hot cocoa in Hilton Garden Inn’s 24-hour Pavilion Pantry. I love that Hilton Garden Inn believes in making their guests’ stay as enjoyable as possible. Big thumbs up for adding Keurig brewing systems to their guestrooms. Remember this partnership next time you’re booking a hotel. It sounds to me Hilton Garden Inn has all the important bases covered: Comfort, Convenience and Coffee! I would love to stay there. Always wanted a keurig. I love that they have not only good coffee but a Keurig. I love that it is a nice clean coffee brewer also. I have seen some nasty coffee pots in some hotels. i would love to have a keurig in my hotel room! Nice! I stayed at the hilton garden inn in Toronto recently and no Keurig in room =( I’ll have to ask for that next time guess I got unlucky! I have to travel a lot and I love a good cup of coffee to start the day. However, I don’t like spending $6 at Starbucks and the in room coffee at 99% of hotels is horrible. Next time, it’s the Hilton! Ya know, coffee is a make it or break it thing with me. I need to have quality in-room coffee. Earlier this week we stayed at a 4-Star hotel with no in room coffee, you had to actually request it. No charge, but still. Who has time to wait on housekeeping to bring it up? From now on, I’m going to look for Hilton Garden Inn! Those rooms are so nice. I think I could just relax, drink my coffee, and lay in bed all day. I can’t think of a better get a way. Wow Hilton got even better! Hurray for Keurig in the rooms now! It is such a great perk to have good coffee in your hotel room. It would definitely make me stay there more often! I think it’s a great idea. I would love a keurig at home. Can someone please let Santa know if you see him? Nice place for sure and to have some great coffee when waking up! A Keurig is 32092x better than the teeny 4 cup percolators they usually have. What a wonderful idea for an addict like myself. That is great. I hope others follow suit, Keurig’s in hotel rooms is an amazing idea! What a great idea, hubby and I travel a lot and are always disappointed when there are no coffee making facilities in the room which happens a lot in Europe! 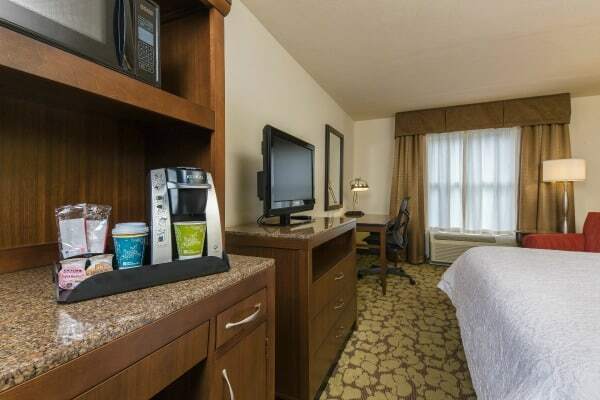 I enjoy staying at the Hilton Garden Inn very much, the rooms are clean, the furniture is very nice, the beds comfy, everything is nice and clean and they are quite reasonably priced, as well! I also love the Keurig in the room! Very smart. I wouldnt have said it tops my list, but bad hotel room coffee (and dirty coffee makers) are a big pet peeve! WOW! Hilton really care for their customers! I really love this Keurig bar, and how nice that you get to have this in this room. And to be able to get this right away in your room is awesome! Love the coffee in the room – single cups Keurig. I would definitely want in-room coffee, and good coffee. I totally agree with you on the other important items, too! Although I’d go for a whole pot of coffee, not just one cup!!! We’re staying at a Hilton Garden Inn soon. I’m excited to know they have Keurigs in the rooms! Love the idea of Keurigs in rooms! clean, and I can have tea! Keurigs are the cat’s meow! Usually when a hotel states they have an in room coffee maker it doesn’t mean anything to me other than bad coffee. Not in this case! that would be a nice comforting bonus! I will try them next time I go on a trip! love coffee!!! I love my Keurig!! Having one is a hotel room is ideal as I am the only one in my family who enjoys a cup in the morning. I would hate to brew a pot and waste some, and also hate to get out of my PJs to go downstairs to get a cup. We were recently at a Hilton Garden Inn in Michigan for the 2014 Winter Classic; it was SO cold, and I was SO glad to be able to come back to my room and make my favorite drink using the Keurig! We’re staying at the Hilton in DC – super excited for good coffee! One of my “wants” is a fridge, so I can make green smoothies, even on vacation!! What a great idea, in room keurigs. I’m a big fan! !